BOSTON, NOV. 24, 2015…..As one of the biggest shopping days of the year approaches, Rep. Jay Livingstone joined a consumer advocate group Tuesday in urging the public to educate themselves about dangerous or toxic toys they say should not be on gift lists. 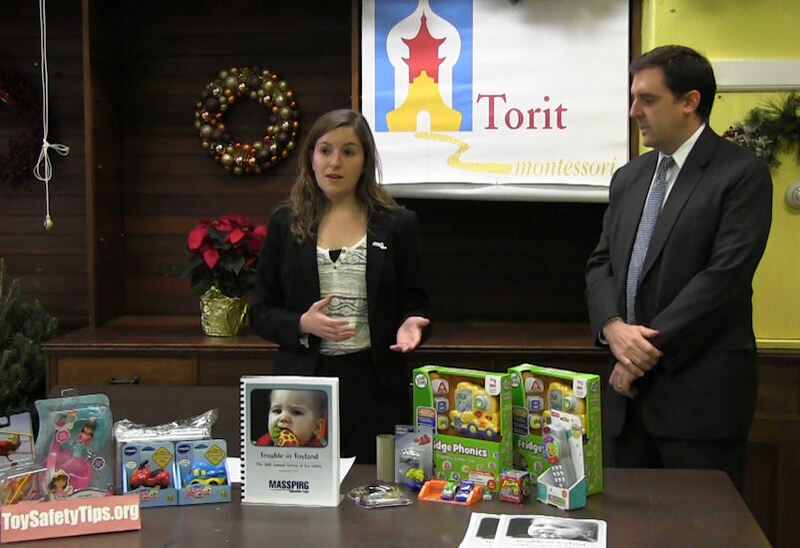 The 30th annual “Trouble in Toyland” report, released by MassPIRG, includes toys that pose a choking hazard like balloons, toys that include toxic chemicals like chromium and phthalate found in Fun Bubbles jump rope, toys with strong magnets that could injure a child if swallowed like Sizzler noise magnets from Family Dollar, and loud toys that could damage a child’s hearing like VTech Go and similar learning products found at Target, according to the consumer group. “The holiday season is such a joyful time and the last thing that anyone wants is to buy a toy for a child that is going to hurt them in any way,” Livingstone said. Livingstone, who also attended last year’s report unveiling, said this year’s list holds new meaning because he and his wife are expecting their first child in February. “When it comes down to it, the U.S. is the biggest market for toys in the world so we definitely – no matter where they’re being made – we have a right to demand for toys that meet our standards for safety,” said Michelle Surka, toxic toy advocate for MassPRIG. Surka said while there has been progress made in toy safety enforcement, some dangerous toys are still landing on store shelves. Toys highlighted in the report were made in a variety of countries, she said, and some could have been made in the United States. MassPIRG held simultaneous report release events with other state lawmakers in various locations around the state.